What you think about, you bring about. Whether you give much credence to the book The Secret or the Universal Law of Attraction, I do believe that what you focus on, you do bring about – universal law or just what your conscious mind focuses on, it’s what you pick up in your environment. The more positive you can be, the more positive your day and the better chance of you sticking to your plan/goal path. Persistent and Consistent. Many people rush out of the starting gates of trying to do something like working out or dieting only to lose steam and fall off the “goal wagon.” I have found it is much easier to start slow, be consistent, and stick with it to build your momentum like a train, instead of darting out and tripping over your own feet. Compound Effect. The Compound Effect was introduced to me by Darren Hardy in his book of the same name. It is very similar to being Persistent and Consistent. Even a little action is better than none, and sticking with it, building on it and working off your past success will compound to huge rewards down the road – even if it is as simple as switching your late night snacks from chips to veggies, it will compound to a much healthier life years down the road. Ripple Effect. I learned about this concept and the phrase “Do It Anyway” from Doug Grady’s book, The Ripple Effect. The ripple effect is making those small positive changes, like the compound effect, and slowly but surely they will ripple out and affect other aspects of your life – start working out, you feel better, you are in a better mood, your relationships improve, you think more clearly, you are more creative, you have more energy, people enjoy being around you more, you are willing to help out and in turn, others help you…this simple effect can have dramatic changes in your life. Write Down Your Goals. I feel it is vitally important to write down your goals (or type them out) so you have them somewhere you can look at them, review them, and change them if necessary. Don’t rely on your memory! Human memory can be too inconsistent. This is a concept introduced to me by Raymond Aaron. This is where you write down a date in the future and the goal you have as if you have already attained it. What this does is give your sub-conscious the “command” that it has already accomplished the goal and its job now is to catch up and make it happen (subtle, sub-conscious things like boosting self-control). Another part of Backwards Goals is setting something called MTO, which is your Minimum; Target and Outrageous goals during the time from now till the date you have written down your goal was accomplished. An example would be that with me wanting to lose weight, I would set a Minimum Goal of weighing 190lbs, Target Goal of weighing 180lbs and Outrageous weighing 170lbs by (six months from now). 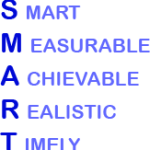 SMART Goals are Specific, Measurable, Achievable, Realistic and Timely. Though this might seem to be the opposite of Backward Goals, they can actually work hand in hand (which I will cover later). When you are setting goals, especially starting with Backwards Goals, you face the mental battle of what you want vs. what you think might actually be attainable. This is where the two methods can work together for the same end. Use your SMART goals as intermediary steps to your Backwards Goals. For example, if I have my Outrageous Backward Goal in six months set at losing 30lbs, my SMART goal is 10lbs in one month. Thirty pounds might seem to be a lot for me, but I know I can do 10lbs in one month if I try hard. So my SMART goal is a step in my Backward Goal. Any goal has to be realistic because if it is not, you won’t believe you can actually attain it and you will be much more likely to give up. That is not the way to accomplish your goals. You just have to have faith that if you follow the realistic goal you have for yourself – be persistent and consistent and know the compound effect is always at work – you will attain your goals. If part of my weight loss goal plan is to run and I haven’t run in 10 years, starting out running 10 miles a day isn’t realistic. But I know starting off with walking and a bit of light jogging is realistic. Then soon, I will be running those 10 miles a day with persistent and consistent effort. So “I want to lose weight” isn’t a goal, but more of a rough ideal that needs to be cleaned up. If I wanted to lose weight and today was May 29th, a SMART goal would be “I want to lose 10lbs by July 1st by staring off with light walking and jogging and building myself up to running each day.” Now that is something you, your logic and you sub-conscious mind can work with! I constantly fight with the problem of being persistent and remembering to do the things I told myself I was going to do to attain my goals (one goal is easy, but if you are working on multiple goals or one goal has a complex set of daily “to-do’s”, you might need help, too). The chart, which my wife and I picked up from a training seminar, is a means of motivating and reminding you of simple, easy tasks to do to get you to where you want to be. There is no right or wrong way to set up a chart, you just have to figure out what works for you. And it is simply assigning a point value to a task for a given day and trying to get a set amount of points each day so you feel like you are working towards your goals in a positive way. I print my chart out each week and figure up the totals at the end of each day. See? It is quite simple and easy to use. It’s for you and you can do what you want with it. And please don’t get to down on yourself if you aren’t making your daily points all the time. Part of goal setting is being realistic, so if you aren’t making your points each day, you might have to re-evaluate how you did your chart and make it a bit more realistic for yourself at the present time. I truly hope you found this helpful! Please leave a comment, suggestion or concern if you have one. If you are interested in more information, stop over at www.SuccessFreaks.com and listen to some of Mordant & McFall’s podcasts on Goal Setting and Dream chasing (use the search box). I am husband, father, dreamer catcher, success freak, web code junkie, bigfoot hunter, juggler, old school role-playing gamer, reader, Sci-Fi/Fantay fan, history lover and all around just a laid back kind of guy.